LOHHEIDE, Germany — On a former Cold War base, German and Dutch soldiers, serving together in one tank battalion, stood to attention one recent morning and shouted their battle cry in both languages. “We fight —,” their commander bellowed. “— for Germany!” the battalion replied in unison. “We fight —,” the commander shouted. “— for the Netherlands!” his soldiers yelled back. They are not shouting “for Europe.” Not yet. But the battalion — Europe’s first made up of soldiers from two countries — is an important baby step toward deeper European military cooperation. First floated after World War II, the idea of a European army is as old as the European Union itself, but has yet to become a reality. Now, though, the idea has taken on new urgency because of the Trump administration’s threat to withdraw the Continent’s security guarantee if it does not spend more on its defense. At a high-level security conference last weekend, the breach between the United States and Europe burst into the open, leaving many European officials feeling increasingly on their own. Yet if some powerful European leaders are talking more loudly about a European military, the political moment is fraught. Populist parties are surging across the Continent, amid a rising nationalism that threatens European cohesion and has made the prospect of surrendering sovereignty on a sensitive issue like national security even harder. 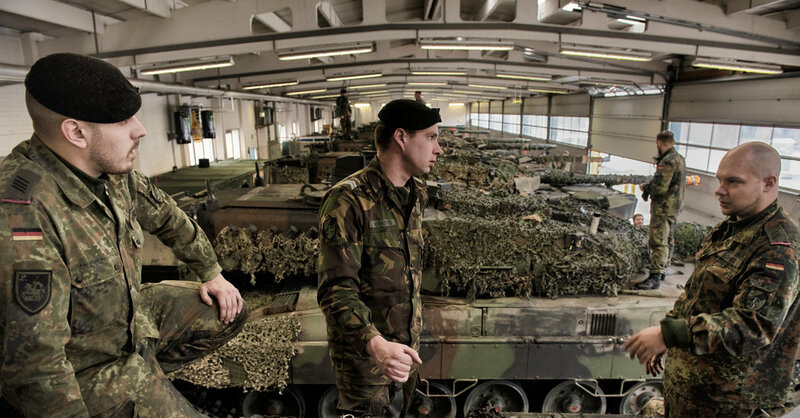 Moreover, the practical challenges to more credible European defense cooperation are immense. For any progress, analysts agree that Germany, Europe’s biggest and richest country, must do more, including overcome its post-World War II reluctance to lead in strategic matters. The German military already has too few soldiers, too little equipment and faces shortages of just about everything, even thermal underwear, which in some cases is being reclassified as “functional” so that it can be reused by others. The military base in Lohheide is the continent’s difficult history writ small. Built by the Nazis in the 1930s, and used by Allied forces during the Cold War when West Germany was still NATO’s eastern border state, it is now home to an experiment in post-national defense. The battalion is German, but one in four of its soldiers are Dutch. The tanks are German, the radio system is Dutch and the language of command increasingly English. Often Germans and Dutch ride in the same tank. “We already work much more closely together than the politicians had envisaged,” said Colonel Niemeyer, the German commander. “We no longer think in national terms,” he said. Would he die for Europe? But the contrast between the idealism on display in the barracks and the absence of political leadership remains striking, analysts and defense experts say — especially in Berlin. “There is a gigantic mismatch between the tactical-military and the political level,” said Jan Techau, director of the Europe Program at the German Marshall Fund in Berlin. Ultimately, he said, the question President Trump has asked the Europeans is a fair one. At the end of the Cold War, Germany had 500,000 soldiers and more than 3,000 tanks, and spent 2.4 percent of its gross domestic product on defense. Today, it has 182,000 soldiers and 325 tanks, and spends just 1.3 percent of G.D.P. on defense. Despite signing a commitment to fellow NATO members to work toward spending 2 percent of G.D.P. by 2024, Germany has watered down the target to 1.5 percent. Military spending has increased for five straight years, she said, up 36 percent. Germany is NATO’s second-biggest contributor of funds and troops. But critics say that is not good enough. On average, only one in three of Germany’s Eurofighter jets and combat helicopters fly, according to figures published last year, the latest available. In January, just three of six submarines and well under half of the two dozen A400M transport planes were fit for purpose. “In all areas there is a shortage of material,” Hans-Peter Bartels, Germany’s parliamentary commissioner for the armed forces, wrote in a report this month. Battalion 414 showcases the necessity of European cooperation: Germany has too few soldiers, the Dutch lack a tank program. But together they can make a battalion. “It is two fragile parties propping each other up,” said Thomas Wiegold, a respected military blogger. In an interview, Mr. Bartels said that he believed a European army — or an army of Europeans, as he prefers to call it — was the future, but that it would take a generation to form. Efforts like Battalion 414 are “islands” that need to multiply and then coalesce into a credible continental defense structure, he said. It would also have to include a security council to make decisions about deploying forces, as well as a unified command. All that is a challenge — not least because Germans simply don’t feel at risk. Seven out of 10 Germans do not see Russia as a threat, recent surveys show. Three times more Germans trust President Vladimir V. Putin of Russia and President Xi Jinping of China to “do the right thing” than Mr. Trump, who is seen as a bigger threat than North Korea. “We have failed to explain to the German people how profoundly our geopolitical situation has changed and how profoundly that changes the role of Germany,” said Norbert Röttgen, a lawmaker from Chancellor Angela Merkel’s conservative party. One reason Battalion 414 has been so successful is that northern Germans and Dutch people are culturally close. Despite talk by Ms. Merkel and President Emmanuel Macron of France about a “real European army,” the experience of the Franco-German brigade in Alsace has been very different. “The Germans don’t speak French; the French don’t speak English,” Mr. Bartels said. To make a European army work, Germany will have to overcome an innate caution since World War II about military intervention. History is never far in Germany. Cpl. First Class Leon Berkepeis is among 100 Dutch soldiers staffing German battle tanks under German command. His grandfather, a Dutch freedom fighter, was shot dead by the Germans during Hitler’s occupation of the Netherlands. Nearly eight decades later, one of his friends in the battalion is a German whose grandfather was in the SS. The base in Lohheide is walking distance from Bergen-Belsen, the former Nazi camp where Anne Frank died in 1945. Some buildings on the base were used by the camp toward the end of the war. Today, there are regular visits organized for soldiers. Some Dutch soldiers recalled being told to avoid World War II jokes before arriving. “Don’t mention the war,” a German major had warned them. German and Dutch soldiers said they still don’t know if they get to keep the thermal underwear they were assigned for a major NATO exercise in Norway last fall. Apart from that, the battalion has few complaints. Its fleet of 24 Leopard tanks is set to expand to 44 by year end. But the soldiers know they are the exception to the rule.